A pencil is a hexagonal prism or cylinder-shaped writing utensil that is also used to draw, usually on paper. A pencil is usually made with a piece of carbon mixed with clay that has a wood case around it. Colored pencils are a type of pencil that instead of greyish silver, the tip is colorful. Colored pencils or crayons are usually meant for drawing rather than writing. An important difference between pens and pencils is that the tip of a pencil is made of graphite (or lead) and pens have tips made of metal with ink coming out of the bottom. Pencil writings do not smudge or wash away if the paper gets wet, unlike pens which have ink. Writing with a pen will usually smudge. Writing from a pencil can be erased, but writing from a pen usually cannot. Finally, while pencils have been around for thousands of years, pens have only been around for about three hundred. An early writing tool was the reed pen used by ancient Egyptians, who wrote with ink on sheets of papyrus paper. Another early writing instrument was the stylus, which was a thin metal stick, often made from lead. It was used for scratching onto wood covered with was, a method used by the Romans. The word pencil comes from the Latin word pencillus which means "little tail". It is an invention of the 16th century in England. Some time before 1565 (it may have been as early as 1500), an enormous deposit of graphite was discovered in Borrowdale, Cumbria. The locals found that it was very useful for marking sheep. This particular deposit of graphite was extremely pure and solid, and it could easily be sawn into sticks. This is still the only large scale deposit of graphite ever found in this solid form. Chemistry was in its infancy and the substance was thought to be a form of lead. Consequently, it was called plumbago (Latin for "lead ore"). 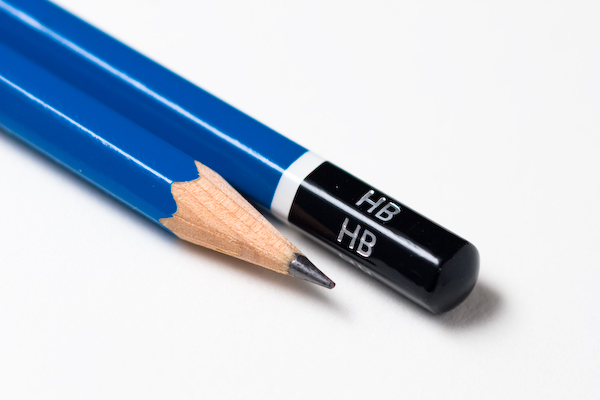 The black core of pencils is still referred to as lead, even though it never contained the element lead. The value of graphite was soon realized, mainly because it could be used to line the moulds for cannonballs. The mines were taken over by the Crown and guarded. When sufficient stocks of graphite had been accumulated, the mines were flooded to prevent theft until more was required. Graphite had to be smuggled out for use in pencils. Because graphite is soft, it requires some form of holder. Graphite sticks were at first wrapped in string or in sheepskin for stability. The news of the usefulness of these early pencils spread far and wide, attracting the attention of artists all over the known world. England continued to have a monopoly on the production of pencils until a method of reconstituting the graphite powder was found. The distinctively square English pencils continued to be made with sticks cut from natural graphite into the 1860s. The town of Keswick, near the original findings of block graphite, has a pencil museum. Residual graphite from a pencil stick is not poisonous, and graphite is harmless if consumed. The number 2 pencil got its title from the shade of darkness it has (second most dark) from pencil #1-5. This pencil's shape is typically hexagonal and is frequently wood cased. They can write under water, upside down and in space. They can also write up to 45000 words. The Italians first thought of wooden holders. In 1560, an Italian couple named Simonio and Lyndiana Bernacotti created the first blueprints for the modern carpentry pencil to mark their carpentry pieces. Their version was instead a flat, oval, more compact type of pencil. They did this at first by hollowing out a stick of juniper wood. Shortly thereafter, a superior technique was discovered: two wooden halves were carved, a graphite stick inserted, and the two halves then glued together–essentially the same method in use to this day. English and German pencils were not available to the French during the Napoleonic Wars. France was under naval blockade imposed by Great Britain and could not import the pure graphite sticks from the British Grey Knotts mines – the only known source in the world for solid graphite. France was also unable to import the inferior German graphite pencil substitute. It took the efforts of an officer in Napoleon's army to change this. In 1795, Nicholas Jacques Conté discovered a method of mixing powdered graphite with clay and forming the mixture into rods that were then fired in a kiln. By varying the ratio of graphite to clay, the hardness of the graphite rod could also be varied. This method of manufacture, which had been earlier discovered by the Austrian Joseph Hardtmuth of Koh-I-Noor in 1790, remains in use. 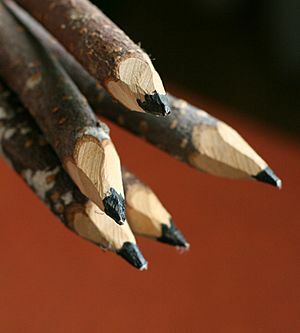 In England, pencils continued to be made from whole sawn graphite. Henry Bessemer's first successful invention (1838) was a method of compressing graphite powder into solid graphite thus allowing the waste from sawing to be reused. American colonists imported pencils from Europe until after the American Revolution. Benjamin Franklin advertised pencils for sale in his Pennsylvania Gazette in 1729, and George Washington used a three-inch pencil when he surveyed the Ohio Territory in 1762. It is said that William Munroe, a cabinetmaker in Concord, Massachusetts, made the first American wood pencils in 1812. This was not the only pencil-making occurring in Concord. According to Henry Petroski, transcendentalist philosopher Henry David Thoreau discovered how to make a good pencil out of inferior graphite using clay as the binder; this invention was prompted by his father's pencil factory in Concord, which employed graphite found in New Hampshire in 1821 by Charles Dunbar. On 30 March 1858, Hymen Lipman received the first patent for attaching an eraser to the end of a pencil. In 1862 Lipman sold his patent to Joseph Reckendorfer for $100,000, who went to sue the pencil manufacturer Faber-Castell for infringement. In 1875, the Supreme Court of the United States ruled against Reckendorfer declaring the patent invalid. The metal band used to mate the eraser with pencil is called a ferrule. The first attempt to manufacture graphite sticks from powdered graphite was in Nuremberg, Germany in 1662. They used a mixture of graphite, sulfur and antimony. Though usable, they were not as good as the English pencils. English and German pencils were not available to the French during the Napoleonic wars. It took the efforts of an officer in Napoleon's army to change this. In 1795 Nicholas Jacques Conté discovered a method of mixing powdered graphite with clay and forming the mixture into rods which were then fired in a kiln. 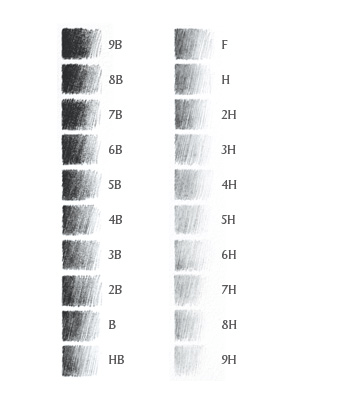 By varying the ratio of graphite to clay, the hardness of the graphite rod could also be varied (the more clay, the harder the pencil, and the lighter the color of the mark). This method of making pencils is still used today. Today, pencils are made industrially by mixing finely ground graphite and clay powders, adding water, forming long spaghetti-like strings, and firing them in a kiln. The resulting strings are dipped in oil or molten wax which seeps into the tiny holes of the material, resulting in smoother writing. A juniper or incense-cedar plank with several long parallel grooves is cut to make something called a slate, and the graphite/clay strings are inserted into the grooves. Another grooved plank is glued on top, and the whole thing is then cut into individual pencils, which are then varnished or painted. A few common brands of colored pencils (among other items) are Crayola, RoseArt and Cra-Z-Art. Pencil Facts for Kids. Kiddle Encyclopedia.